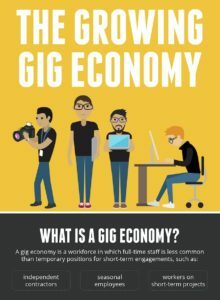 The gig economy is a workforce in which full-time staff is less common than temporary positions for short term engagements like independent contractors, seasonal employees, and workers on short term projects such as live events. Over the next few years, it is anticipated that 40% of all workers will be short-term employees only. Advances in technology, especially those platforms that help with labor process automation such as employee scheduling software, has been helping the gig economy grow because it allows Event Service organizations to simplify the process of scheduling, communicating with and managing the crew they need. Industry professionals also rely on employee scheduling software to assist with meeting compliance goals and provide in-depth data and analytics that lead to better business decisions. For companies drawing labor forces from the gig economy, simplification and growth are two major goals. LASSO gives Event Service organizations the tools they need to eliminate frustrating and tedious manual processes. LASSO boosts the ability to make strategic decisions with the industry’s first fully integrated business intelligence software. Check out LASSO’s new infographic and learn more about the growing gig economy and how LASSO’s employee scheduling software will make a difference for your business. How Do You Manage Labor Processes and Crew in Today’s Gig Economy?